Beginning with this week’s newsletter, I’ll be giving away books and other prizes to subscribers on a regular basis. You can only win if you’re a subscriber! Please subscribe by filling out the form on the top right-hand corner of my website. 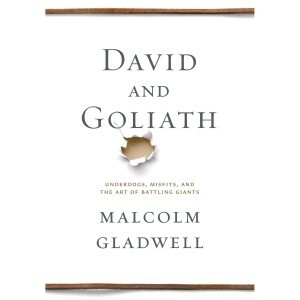 This week’s giveaway is David and Goliath by Malcolm Gladwell, currently #2 on the New York Times’ hardcover non-fiction bestsellers list. Details on how to qualify for the draw will be posted in the newsletter. Good luck! UPDATE – Feb. 17, 2014: Jackie Cantin is the winner! Congratulations! Click here for details on the next giveaway.